People are surprised to learn that I don’t watch a lot of cooking television these days, but four years ago when I was in Sydney I had a real soft spot for Masterchef Australia. One episode had contestents running around New York to cook three different dishes from three different multi-Michelin starred restaurants. This challenge was the first time I ever heard of Paul Liebrandt or ever saw Gold Bar, and it’s been stuck on my mind ever since. 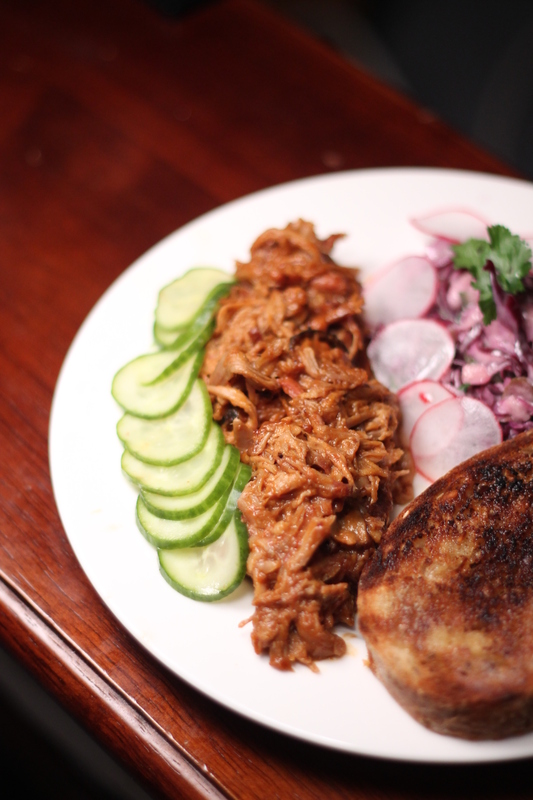 This is an update and review of a dish from my April Supper Club, held on the 17th. 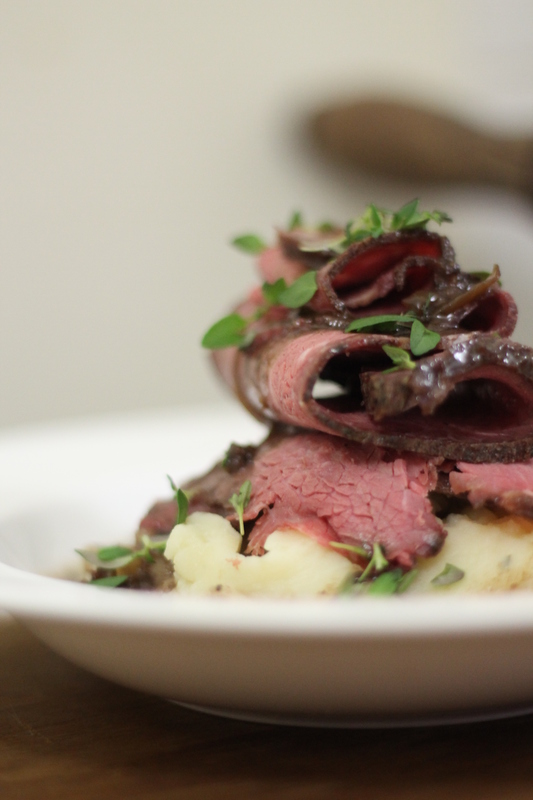 The next supper club date is Saturday the 9th of May. To attend, please email me at smokeandthyme@gmail.com, letting me know how many guests you’d like to bring, a contact phone number and any special dietary requirements I need to be aware of. The menu changes every month and the price is pay-what-you-want. Lemongrass, coconut, coriander, green chilli. Fish sauce, ginger, soy. My Thai soup with mussels demanded a perfectly smooth sauce, which meant sieving out a heartbreaking amount of immensely flavoursome but slightly stringy pulp from my green curry sauce. Not until after I’d thrown the first batch of it away did I get the tip from a friend that this lumpy by-catch could be mixed with mashed potato and cooked crab for a fantastic green curry crabcake. With cauliflower still in season and my previous pairing of it with seafood in mind, I wanted to test out a non-potato binding for another type of crabcake. Adding cayenne and paprika and sumac gave the mixture a dark, red-brownish colour, and unable to pick a favourite between the green Thai or the red cauliflower crabcakes, I decided the colour contrast would justify putting both on the plate. As with so many weird food trends, the blame for savoury ice cream lies with Heston Blumenthal and his infamous bacon and egg flavour frozen treat. Much as I adore Heston’s cuisine however, challenging my diners’ preconceptions isn’t usually my main goal. I was concerned that asparagus ice cream in a starter would be too much like a gimmick – like I’m trying to make a point of doing something wacky. So I was delighted when my guests recognised it for being just a really nice (if slightly unusual) combination of flavours, textures and temperatures. The cream melting over the deep-fried crabcakes is like any cream sauce on seafood, except for being cold, which cuts through the spiciness of the crabcakes. Asparagus, especially when paired with salty samphire, is perfect with crustaceans or anything else from the sea. Sadly at this point we run into my mistake – not nearly enough asparagus flavour to the ice cream. So pungent when boiled or steamed, asparagus’ water-soluble flavour molecules are not taken up so well by fats and oils, and the cold seems to lock them away as well. The temperature and textural contrast of the ice cream worked great, but against the bold, spicy flavours of the crabcakes the asparagus flavour was much too mild. Ultimately, though I liked the taste of the spiced cauliflower crabcakes, I found it too hard to explain what they’re all about to want to serve them again. The thing I liked best was that they provided an alternative to the stodgy, flavour-absorbing mashed potato of a typical fishcake. The Thai green curry ones on the other hand were both delicious and well defined. My next experiment will be to use the same flavours but with a crab risotto (instead of mashed potato) to bind them, and a tempura batter rather than breadcrumbs. 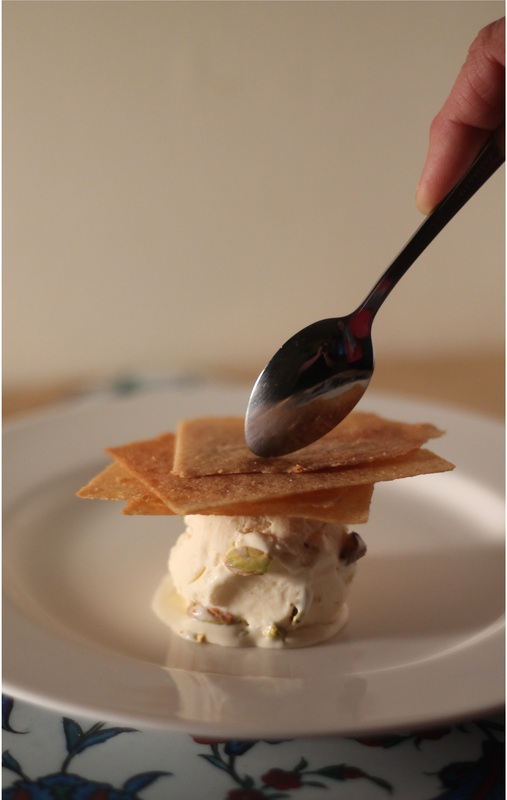 The asparagus ice cream will be back, bigger and stronger, and other savoury ices may make their way onto my non-dessert courses in the future. 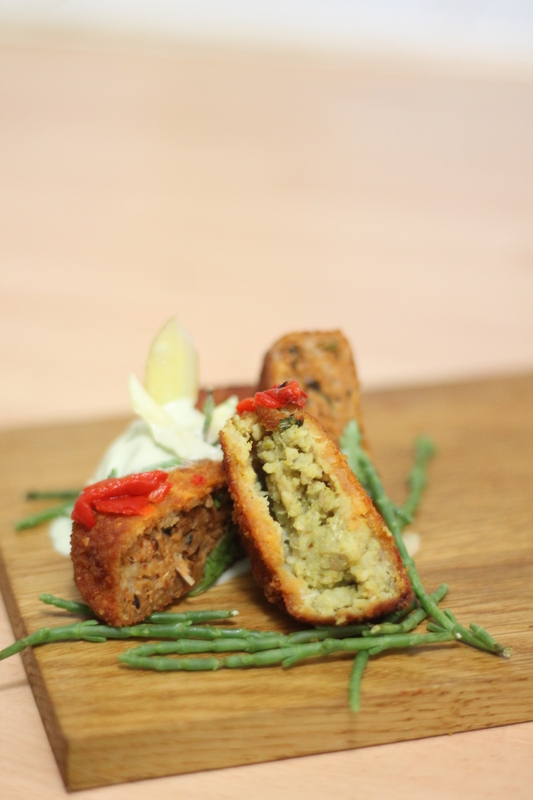 This is an update and review of my March Supper Club, held on the 7th of March. The next supper club date is Friday the 17th of April (changed from Monday 6th). To attend, please email me at smokeandthyme@gmail.com, letting me know how many guests you’d like to bring, a contact phone number and any special dietary requirements I need to be aware of. The menu changes every month and the price is pay-what-you-want. Although this dish kicked off the meal, it was actually the last that I decided on. I’d kept the budget well under control for the main and dessert courses, so I had some room to splash out on this one. One of those ingredients that I truly love but can only occasionally afford are scallops. Though mild, scallops are often paired with very bold flavours. My former partner Finn had told me years ago about a dish he served with scallops and a cauliflower puree. When I worked at Borough Market, Shellseekers Fishmongers served scallops with bacon and onions in their own shells. After a quick test of roasting up and blending a cauliflower, I knew how I wanted to go – a dollop of spiced cauliflower puree in a scallop shell, a sautéed scallop and a garnish of diced crispy bacon and fresh coriander. One of my guests suggested adding saffron to this dish. Although I’m not a great fan of saffron myself, I think in this case it would go really well in the roasted cauliflower puree. The other blindingly obvious addition that I can’t believe I forgot was a squeeze of lemon – both the scallop and the cauliflower would have been enhanced by this. Other than that, I think this dish both presents and tastes beautiful, and I’d definitely do it again. 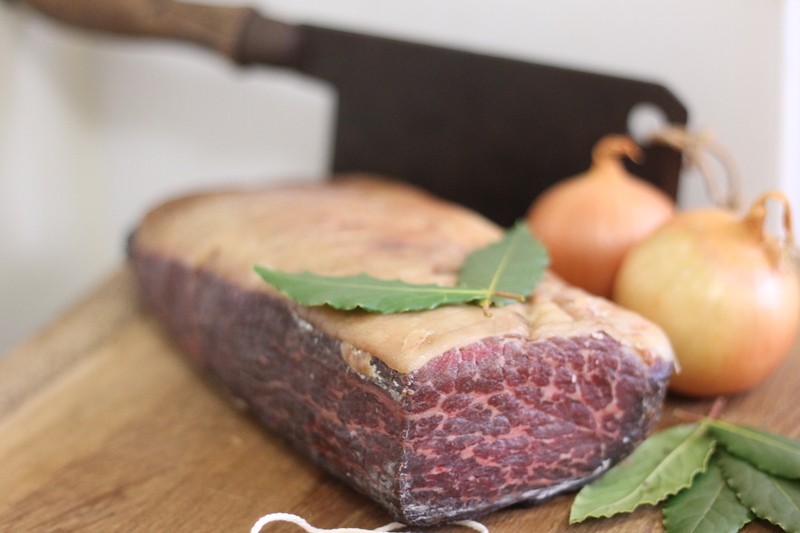 I had bought a piece of beef almost a month ago to experiment with dry-aging. Good beef can be hung for anywhere between three weeks and two months, but it’s an expensive process because it loses weight and requires space and attention. The results however are well worth it. Silverside isn’t one of my favourite cuts, but I got a bargain on a really well marbled piece. I kept it on a wire rack to help the air circulate and kept an eye on it until I thought it looked ready, which fortunately turned out to be right before the date for this supper club. Cutting off a slice and frying it up, I decided that it was a bit tough to do a steak, but the flavour was really good (a common tradeoff). So I decided to roast the beef and slice it extra thin, letting my knife rather than my guests’ teeth do the work. 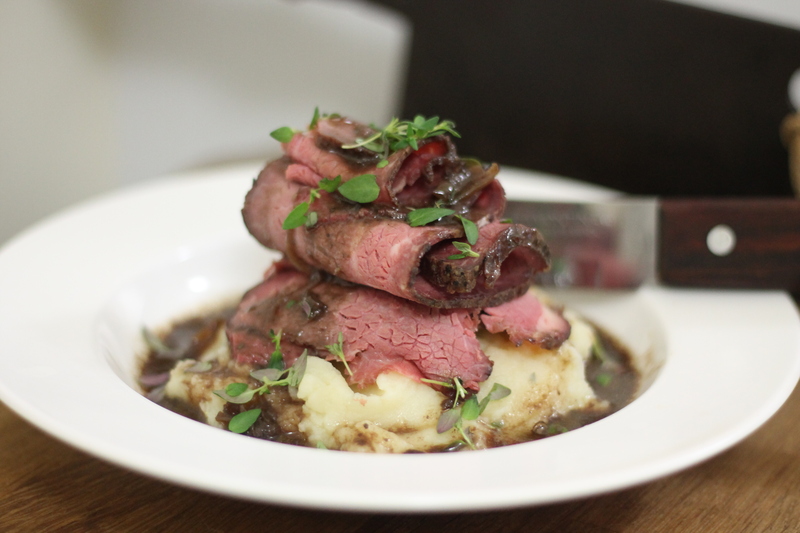 Choosing what to serve with the beef was less about coming up with ideas and more about narrowing them down. Bone marrow mash (from the Pitt Cue cookbook and sold on the name alone), blue cheese butter (a pick from Heston Blumenthal’s In Search of Perfection series), caramelised onions (because caramelised onions), and gravy made the final list. The picture in my head of the plate I wanted didn’t have anywhere for veg, but I decided a big bowl of braised cabbage on the table would finish things off nicely. Verdict: I knew that this one was always going to be a crowd pleaser, but my concern was that it wouldn’t look or be sophisticated enough to fit with the rest of the meal. Turned out I needn’t have worried – this dish looked elegant and the flavours were comforting and traditional but still complex. I liked the table dish of cabbage – it kept the plate presentation delicate while adding to the community feeling of the night. I loved the slick of blue cheese butter on top of the beef, but I think that next time I might mix the blue cheese with the marrow and put those two great flavours right up front, and let the buttery mash stand for itself, or even substitute it for a parsnip dauphinoise or just some more of that fantastic cabbage. Another thing that mint and pistachio share, at least in my mind, is a Middle Eastern connection. Baklava – the combination of nuts, sugar syrup and filo pastry, accompanies mint tea. Just a couple of weeks ago when I was cooking Paul Liebrandt’s Gold Bar dessert, I was struck by the crossover potential of one of the elements of the dessert – the crepe dentelles. These fine, flaky, brittle sheets are halfway between pastry and sugar work, taste like a super rich and buttery version of an ice cream cone, and a stack of flat squares perched atop a scoop of ice cream reminded me of baklava. 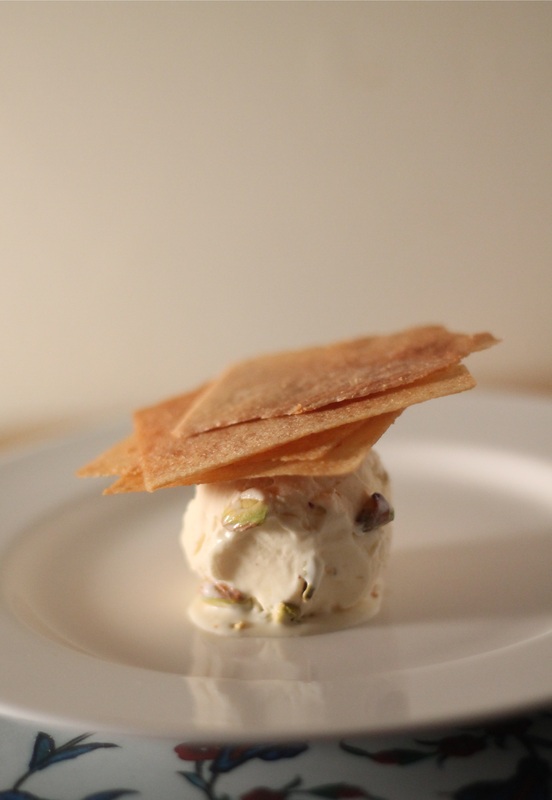 The connection was irresistible to me – the dentelle would not overshadow the ice cream that I felt really deserved to be the star of the dish, but would enhance it and tease at the baklava connection that I had already made in my mind. After testing this dish out, frankly I just loved it. Elegant, simple, clever, sophisticated yet easy to make, this was probably the dish of the night for me. 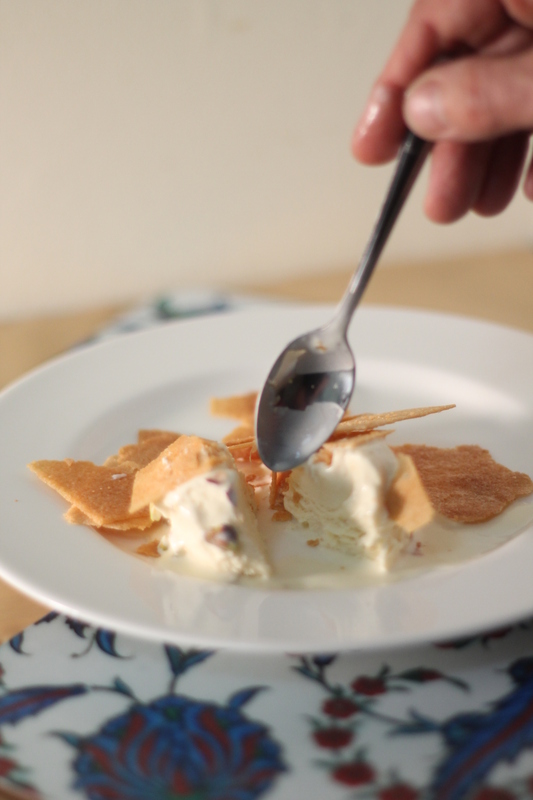 Immediately my mind was spinning off into other flavours of ice cream with a Middle Eastern theme – orange, cardamom and ginger, lemon, honey and pistachio, pomegranate and rosewater – watch this space. It started with a fish. I’d been looking for sea bass, but the sea bass were looking a bit fishy. My eye drifted over to the salmon, and I was hooked. Buy a whole salmon, fillet it myself. Preserve one side with a beetroot-cure and cook the other side for dinner tonight with nothing but a little salt, pepper, a squeeze of lemon and maybe a bay leaf in the pan – just crispy skin and the essential flavours of the salmon. But what did I want to serve it with? A bowl of hot, buttery, new season potatoes, crushed by a fork and sprinkled with grassy chives and flakes of sea salt? Or a nest of wilted spinach – a bitter, dark-green, iron-y tang against the sweet, rich, blushing pink flesh of the salmon? The answer obviously was both, but as soon as those two ingredients were in my head, my thoughts went to saag aloo. 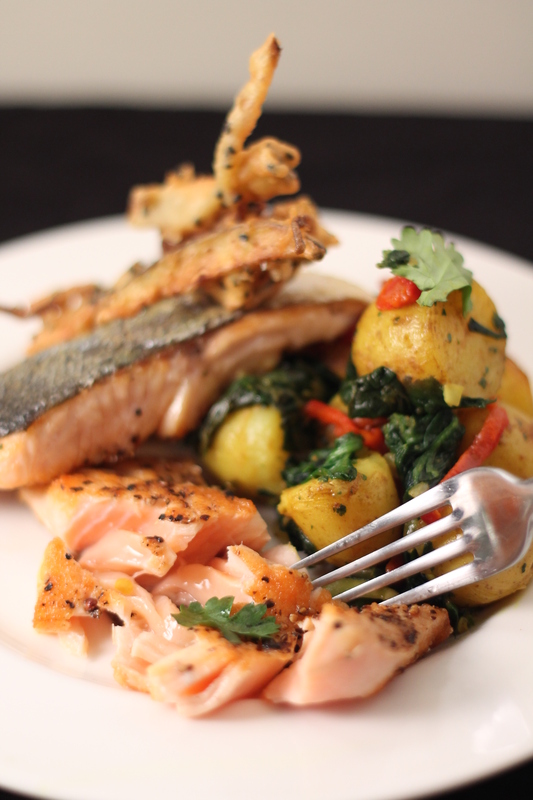 Melding spinach and potatoes with Indian flavours is the best thing I can think to do with either of those ingredients, let alone both, so I was sure it would be the perfect complement to the salmon. 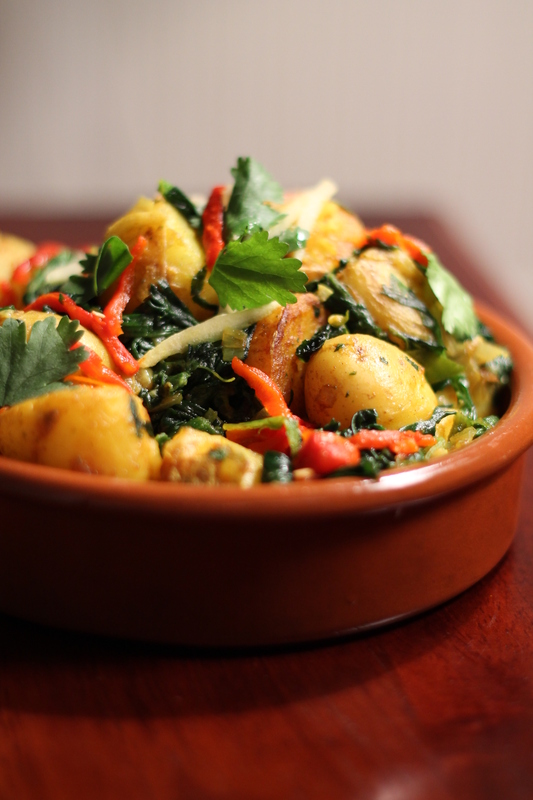 Against a plainer accompaniment salmon can dominate a plate, but faced with the bold and spicy saag aloo it reveals the more delicate side of its fishy nature. At the last minute, I decided to add a vegetable fritter, which backed up the crispy salmon skin beautifully and brought the whole dish together. 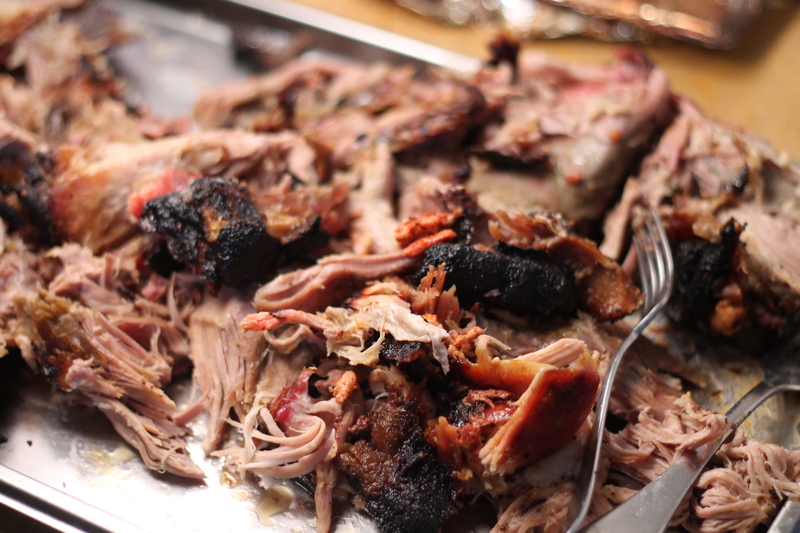 A commitment to eat nothing but pulled pork for a week. So, there are a few sensible reasons to make this more of an occasional treat rather than a regular thing. And then there’s the issue of the chorizo madness. In 2011, I was working at probably the most profitable four-and-a-half square metres of the whole of Borough Market: the barbecue chorizo sandwich stall at Brindisa. And while I loved working in the food mecca of the world’s greatest city, I did not always love working on my own all day for three out of five days of the week. Between the solitude and the monotony of cutting 86,000 odd pieces of chorizo, I may have gone a little bit nuts. I won’t give you all the gory details, but just as an example: once during prep someone asked me for the time and rather than look at my watch I just counted how many boxes of chorizo I had cut (4 1/2 boxes at 9 minutes per box) and correctly told him it was 4:42pm. I was diagnosed by my coworkers with chorizo madness – a disorder caused by working on the barbecue stand too long – shortly after this event. As you can see, spending a lot of time on my own with a vast amount of spicy, barbecue-cooked pork has not always been a positive thing for my sanity. The chorizo stand was also where my love of barbecue started. One of the things I did to distract myself was slow cook joints of meat next to the coals. 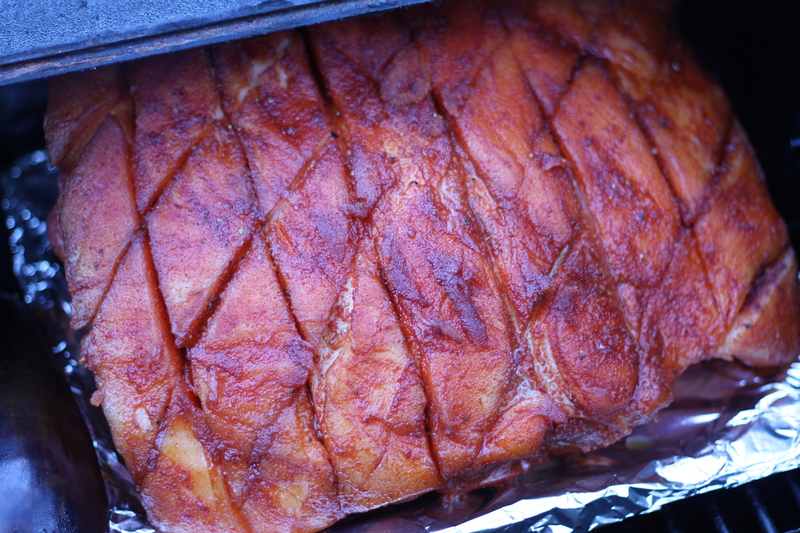 There’s something insanely great about the smokey flavours that infuse over the long cooking time. Smoking, for me, is the real barbecue technique. Grilling is fine, but smoking meat just takes it to the next level. 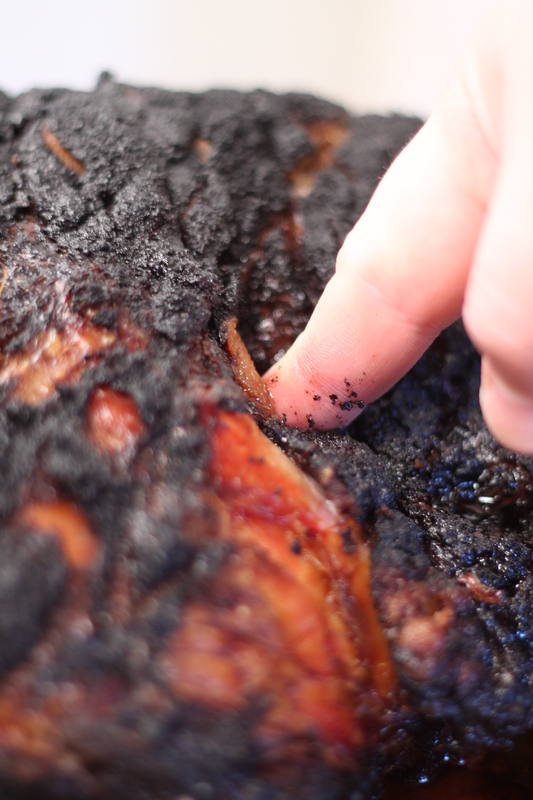 Instead of the intense, direct heat from the charcoal, the meat cooks off to the side in the warm smokey air from a scattering of damp wood chips on the coals. It’s more challenging, and requires a maddening amount of patience and more than a little trial and error to get the low, even heat just right. But there’s just nothing quite like it. Could I make my method a bit more practical? Possibly. Am I going to? Nope. Aside from the fact that I actually kinda enjoy making things a little bit challenging for myself, pulled pork is already dangerously tasty and a threat to my mental health. Making it easy to cook would give it more power than any dish should wield. The most powerful thing a dish can do is to take you back in time. The ratatouille in the Pixar film of the same name transports a jaded restaurant critic back to his mother’s kitchen when he was a boy. Like Proust’s madelaines, this simple peasant dish turns out to have its hooks in a very personal past. 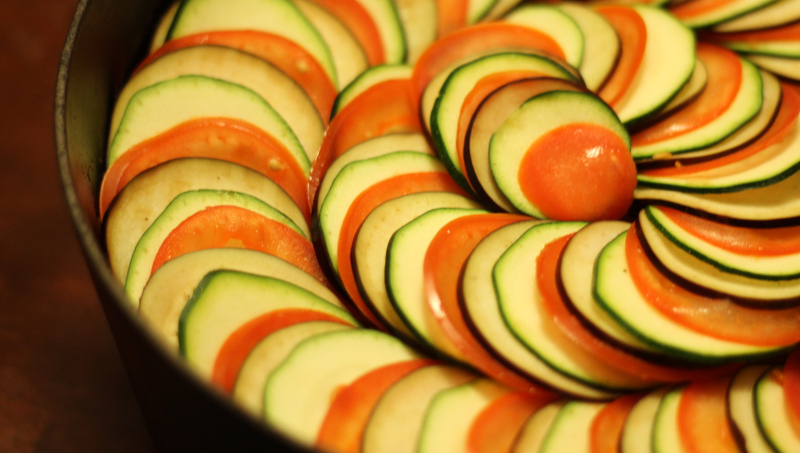 The version of the ratatouille in the movie was developed by Thomas Keller, chef of The French Laundry. 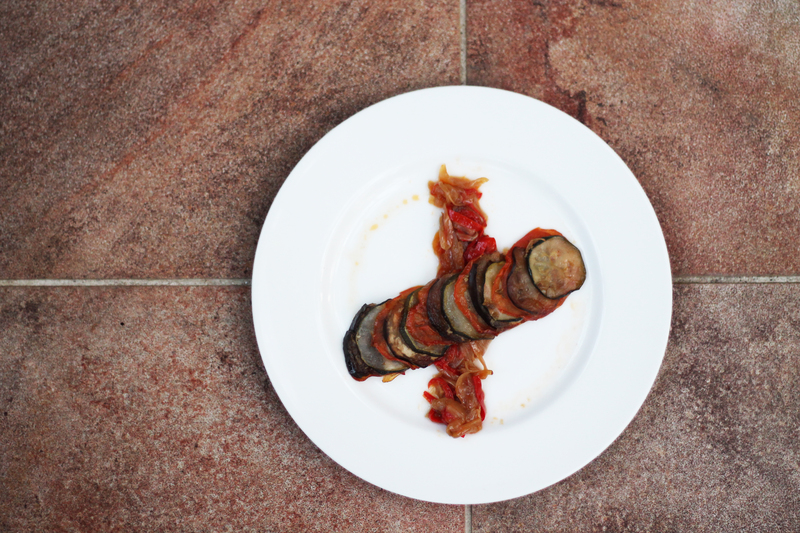 In turn, his dish is based on the ratatouille confit byaldi created by Michel Guérard, one of the founders of nouvelle cuisine, which broke with the old traditions and has been broken from again since. The name comes from an old Turkish dish of stuffed aubergine called “Imam bayaldi” – because when he tasted the dish “the Imam fainted”. The history this dish has in both haute cuisine and peasant fare, in great and unknown chefs, and in movie-makers, restaurant critics and holy men – all of whom have found something special in the dish or in something like it – leads me to feel a really special connection to its past when I make it. 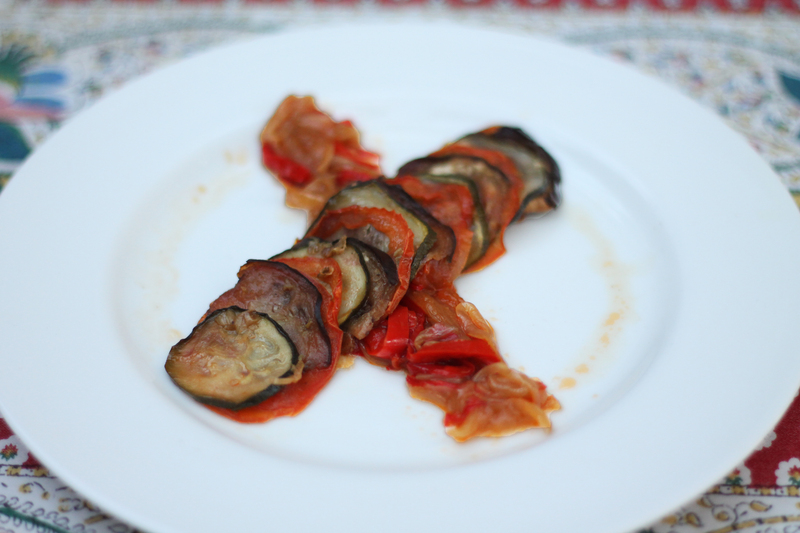 But the first time I tasted confit byaldi, I had the opposite of a Proustian reaction. 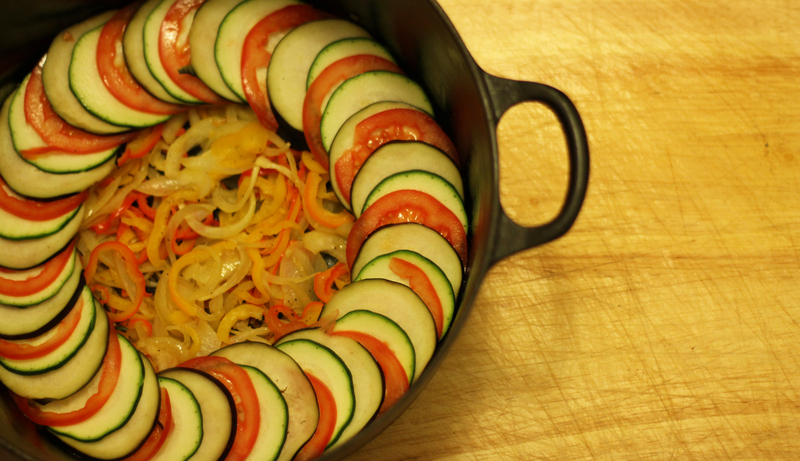 It did not stir up old memories, because this was like no ratatouille I had ever tasted before. So for me, this dish isn’t just a time machine; it’s also a rocket ship – it takes me to a place that’s out of this world. Heat the oil in a large frying pan over a medium heat. Add the onions, peppers and bouquet garni, season with salt and pepper, and cook for 15 minutes, or until the vegetables are softened but not browned. Remove the bouquet garni and spread the mixture in an even layer in a 12″ round ovenproof dish with a tight-fitting lid. Mix the garlic, oil, thyme and some salt and pepper to taste and drizzle over the vegetables. Cover with a lid and bake for 2 1/2 hours. Remove the lid and check the vegetables (the aubergine will take the longest to cook). They should have softened and be cooked or almost cooked. Return to the oven without the lid for 30 minutes more. I haven’t made many changes from the recipe given in The French Laundry Cookbook – just converted the quantities to what worked for me. The only major change is that, as well as the aubergine, courgette and tomato, Thomas Keller’s recipe also has sliced yellow squash, which adds another contrasting colour to the sliced vegetables. I wasn’t able to find any yellow squash. If you can, include it. If not, it will still be delicious. 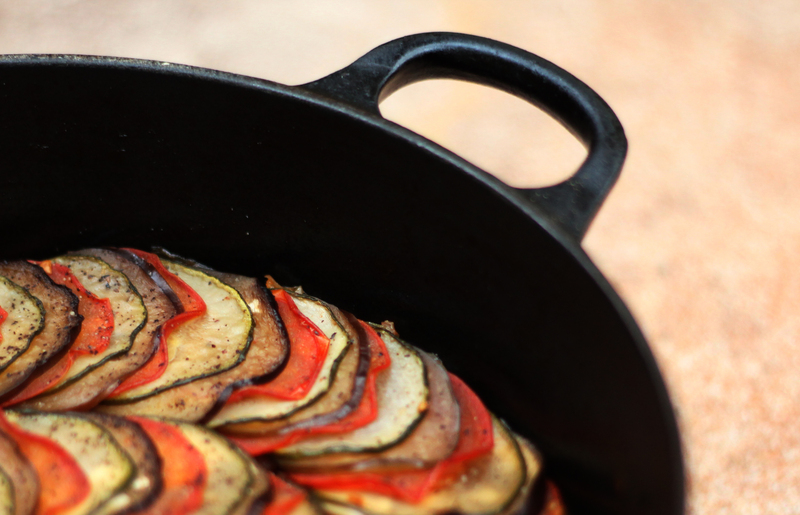 The presentation of this ratatouille is markedly improved if the slices of vegetables are all around the same size. Usually, this will mean buying the slenderest aubergines and the thickest courgettes available. If there is still too much difference in size, you can cut rounds out of the larger slices with a cookie cutter. Tomatoes are hard to cut thinly, even on the mandolin. It helps if they’re firm fleshed, and if your blade is sharp and you slice confidently. You’ll still probably end up with a lot of irregular offcuts. Fiddly, meticulous preparation like arranging loads of overlapping slices is exactly the kind of thing I love. If you’re not a fan, don’t be put off – it looks like it should take forever, but it’s really not that bad. Like most braises, it will improve in the fridge overnight, so you can make it the day before anyway. 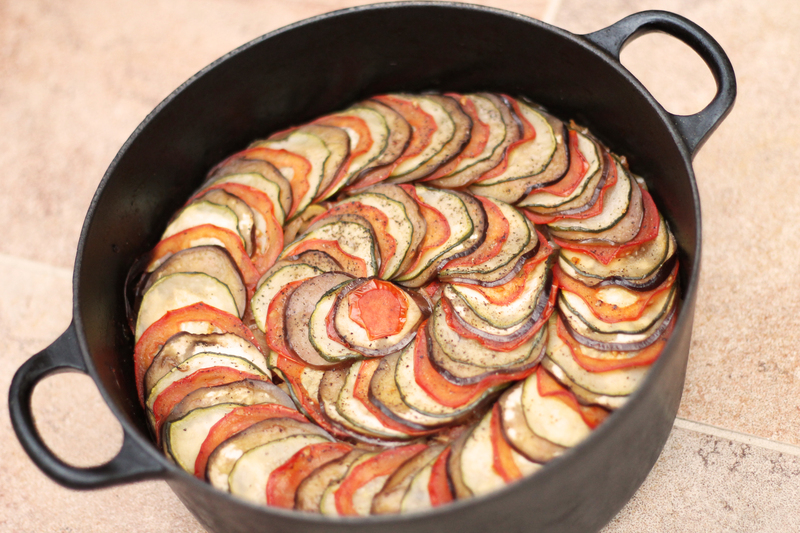 My recommendation for serving this ratatouille: either with gnocchi or crusty bread. It’s also a great to accompany roast chicken. This dish is my hero. Packed with potent flavours. Delivery like a punch in the mouth. A veteran of the Sun and 13 Cantons pop-up, the strong performance of this steak dish saved us from ruin by being a lion for our sales targets. Anyone who doesn’t think veg can be macho hasn’t met purple sprouting broccoli. A vegetable so tough its outdoor season starts in January. My outdoor season doesn’t start til late March, and that’s with a coat on. 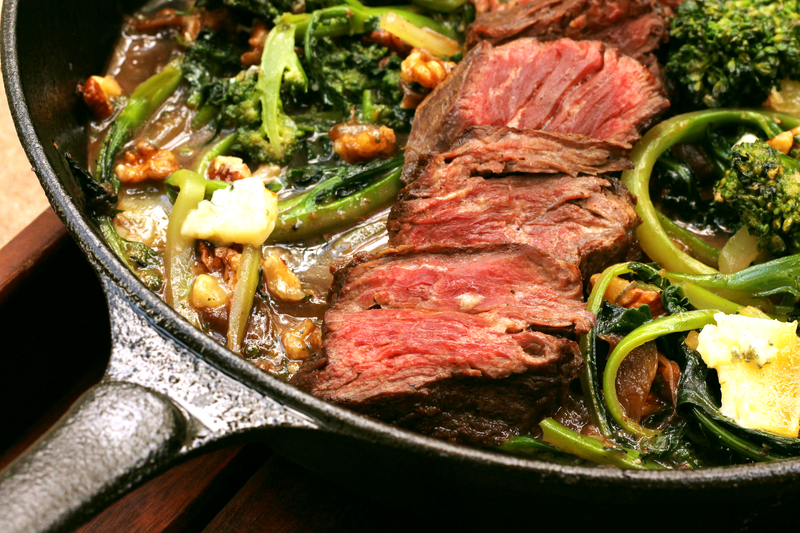 Broccoli goes so well with beef because it shares in bloody steak’s bitter-iron taste. My steak cut of choice is onglet. It’s from a muscle involved in breathing, so it works hard all day, building character with every breath the cow takes. It can be tough, but it also has a tender side waiting to be brought out. Cooked medium rare or less and sliced against the grain it will melt in your mouth. Best of all, as a lesser known cut, it’s half the price of sirloin. My true blue love is creamy Gorgonzola, but I’m cheating on it here for crumbly Stilton, the romantic hero of this piece. 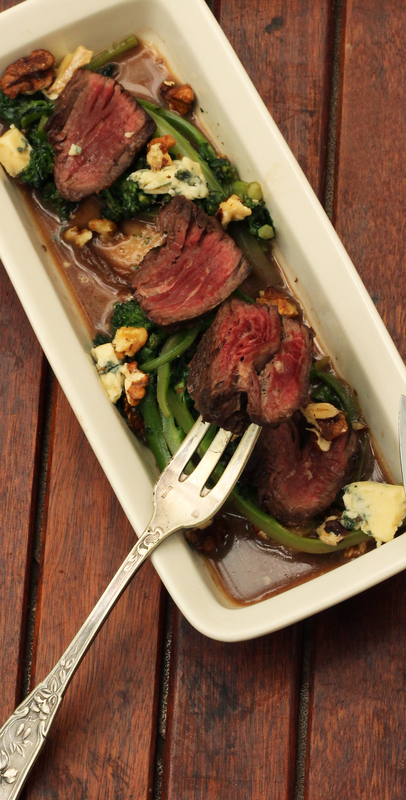 It melts in the arms of the broccoli, but stays full bodied and bold throughout the dish. In fact, this dish isn’t just one hero – it’s a team of heroic ingredients, and combined they are more powerful than they ever were alone. Folklore says that stepping inside a fairy ring, a ring of wild mushrooms, leaves one in thrall to the illusions of the the fairies who built it. 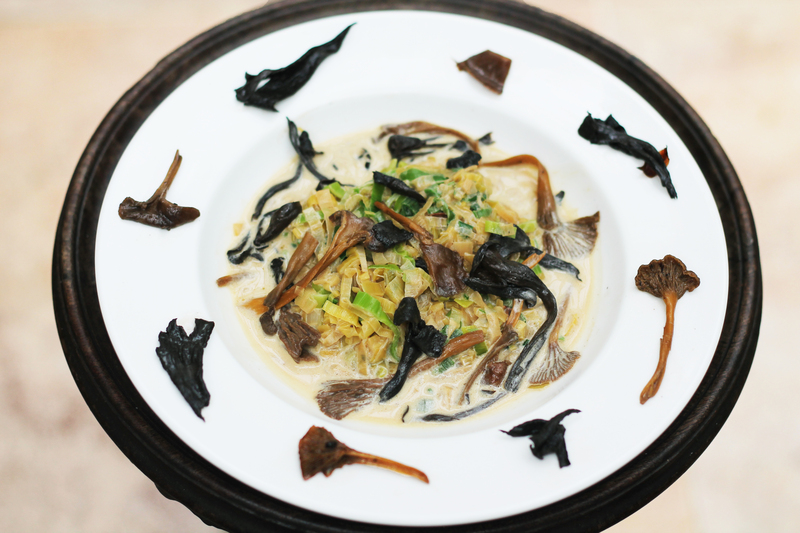 Now I might not be superstitious, and I certainly don’t think that the fantastic flavour of this dish is just an illusion, but if garnishing my plate with a ring of wild mushrooms might give me a helping hand from the supernatural, I’m not about to pass up the chance. 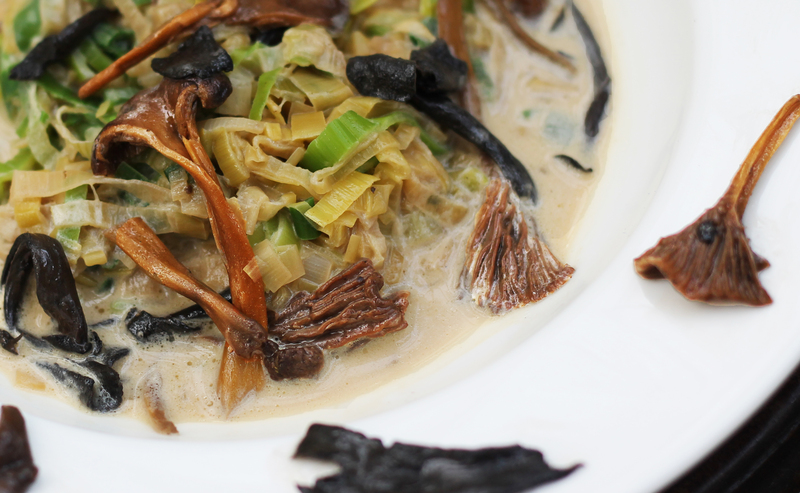 This is a dish that, appropriately enough, has mushroomed into my life – coming out of nowhere and rapidly expanding in size and scope until I ended up cooking it for thirty two people on Thursday, in two separate gigs. In this great but slightly busy past week that I’ve had, I’ve cooked and tweaked this fricassee at least eight times, so I reckon I’ve got it down. “Fricassee” isn’t the most familiar of culinary terms, but it’s an elemental preparation in classic French cuisine. In Mastering the Art of French Cooking, Julia Child describes it as midway between a sauté and a stew. A stew starts with liquid from the beginning, a sauté cooks “dry” – with fat or oil only. A fricassee starts off pan frying in the same way as a sauté, but then adds a liquid to continue cooking as a stew does. As I mentioned in my previous post, leeks are in season right now, and this is probably my favourite way to prepare them. Leeks can be a stringy mass if underdone, or a sulky mush if they’re overcooked, but fricasseeing allows for a lot of control and a wide margin for error. Because it’s creamy, delicate and saucy (yet substantial), when I’m not just eating it on its own I like to pair leek fricassee with white meats and white wines. It goes exceptionally well with slow roast pork belly, and at my pop-up we served it with a stuffed chicken ballotine. It also makes an exquisite pasta sauce, especially if you add a fried handful of lardons and use the rendered bacon fat to sauté the mushrooms.